We’ve created a mobile version of OneNote for your Windows 10 tablet. Use this guide to learn the basics. Browse the ribbon to see what OneNote can do. Tap or click the tabs — it’s up to you. OneNote saves your notebook files automatically and continually, so you can always focus on your work. When you’re working in tablet mode without a keyboard, tap the Undo button to quickly erase mistakes. Tap here to search or print your notes, go to a specific notebook, or set options. Tap a page tab to switch to it, or press and hold a tab to see more options for that page. Maximize your note-taking space on a small device screen by tapping this arrow. Drag the arrow to resize note containers, or drag the frame to move blocks of notes. Notes don’t have to be walls of text. Use the drawing tools on the Draw tab to get creative. What good are notes, plans, and ideas if they’re trapped on a computer at home or at the office? Keep all of your notebooks available to you at every turn by signing into OneNote with your free Microsoft account when you first start the app. OneNote automatically saves all of your changes as you work — so you never have to. Even when you close the app or your tablet goes to sleep, your notes are always saved, so you can continue right where you left off. If you change your mind about recent edits, use the Undo icon near the upper right. If you have a keyboard attached, you can press CTRL+Z to do the same. To manage your notes in the cloud, use any version of the OneDrive app to sign in and view your notebooks, or go to http://www.onedrive.com in any browser. OneNote never runs out of paper. To create new pages, tap the plus sign [+] near the top of the sidebar. In the Recent Notes list, tap the name of the page that you want to edit. To find other notes, tap the [ ≡ ] icon and type into the search box. OneNote gives you the option to work in tablet mode on the go, or in laptop mode when you have a mouse and keyboard attached. Tap anywhere on a page or within a line of text to activate the cursor. Double-tap existing text to begin a selection — which you can then adjust by dragging the handles that appear. To right-click without a mouse, press and hold your finger on text or objects to open contextual menus that offer additional options and commands. While you can easily type notes in OneNote, notes don’t have to be walls of text. Express your ideas and plans creatively with the drawing tools that this version of OneNote offers. OneNote can recognize text in any pictures you’ve inserted (for example, a photo of a receipt). Press and hold the picture, tap Picture on the menu that appears, and then tap Copy Text. Now you can paste the text wherever you want it. In OneNote, pinch-zooming is switched off to avoid frustration with accidental magnification while drawing with a pen. If you want to pinch-zoom in OneNote, tap the [ ≡ ] icon in the upper left, tap Settings near the bottom, and then tap Options, where you can turn on the Use touch to zoom option. Whenever an Excel spreadsheet might be overkill, use OneNote to create quick and easy tables in your notes to help make sense of any kind of information. To begin a table, tap Insert > Table. While any table cell is selected, tap the Table tab to insert, delete, or sort rows and columns. Syncing your notes to the cloud doesn’t mean that they’re automatically shared with others without your consent. Unless you give specific people or groups explicit permission to view and edit your notebook files, your notes are kept private. When you want to invite others to collaborate in your notebooks, you can manage your notebook sharing permissions in the desktop version of OneNote, in any version of the OneDrive app, or from http://www.onedrive.com in any browser. 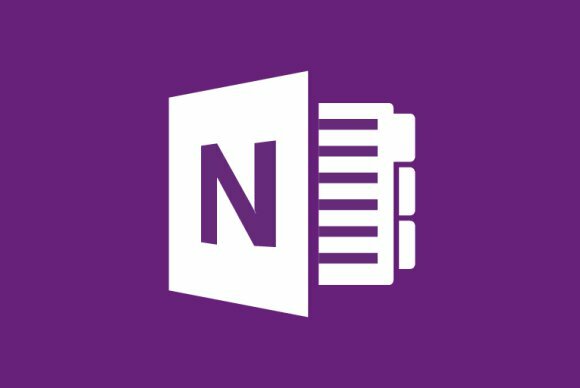 OneNote is just one of the new mobile Office apps for your Windows 10 tablet or device. Visit http://aka.ms/office-mobile-guides to download our free Quick Start Guides for the mobile versions of Word, Excel, and PowerPoint. Not sure where to turn for step-by-step help with OneNote? Tap the [ ≡ ] icon in the upper left, tap Settings near the bottom, and then tap Help, where you can view and search for available OneNote Help articles. Love OneNote? Got suggestions for improvement? We want to hear from you! Tap the [ ≡ ] icon in the upper left, tap Feedback and Apps near the bottom, and then tap Feedback. Follow the steps to submit your thoughts about the app directly to the product team. Thank you!